This stereoscopic anaglyph image was created from a left and right stereo pair of images of the Mars Science Laboratory mission's rover, Curiosity. The scene appears three dimensional when viewed through red-blue glasses with the red lens on the left. The image was taken May 26, 2011, in Spacecraft Assembly Facility at NASA's Jet Propulsion Laboratory in Pasadena, Calif. 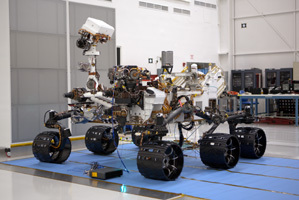 The rover was shipped to NASA's Kennedy Space Center, Fla., on June 22, 2011. The mission is scheduled to launch during the period Nov. 25 to Dec. 18, 2011, and land the rover Curiosity on Mars in August 2012. Researchers will use tools on Curiosity to study whether the landing region has had environmental conditions favorable for supporting microbial life and for preserving clues about whether life existed. JPL, a division of the California Institute of Technology in Pasadena, manages the Mars Science Laboratory Project for NASA's Science Mission Directorate in Washington.